First, some very basics in wine making. Grape juice has sugar; yeast is added and it ferments the juice, consuming the sugar – producing alcohol, carbon dioxide and heat. Made in unsealed containers, ‘still’ wine has no bubbles. In making a sparkling wine, first the winemaker makes a still wine (no bubbles) and puts it into a champagne bottle. Then, to make the bubbles, a small amount of sugar and yeast is added to the wine in the bottle. A bottle cap (like a Coke bottle cap) seals the bottle and it is set aside to referment; this traps the carbon dioxide bubbles produced by the fermentation of the added sugar and yeast. This process also traps the dead yeast cells in the bottle. After appropriate rest, it’s time to remove the yeast residue. 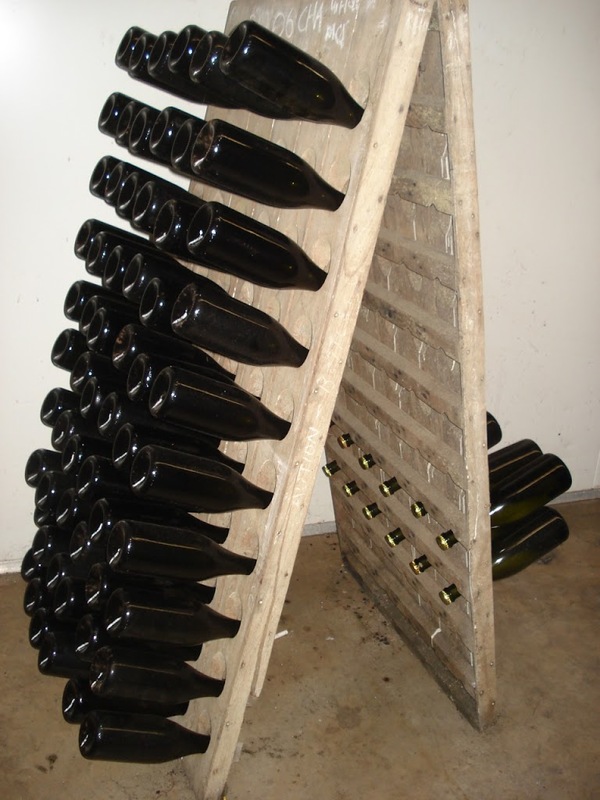 The bottles are put in A-frame holders and the riddling process begins. Now it’s time to disgorge the residue. The bottles are set upside down in a freezing brine solution to freeze the yeast sediment and form a “plug” near the cap. The bottles are turned upright, the cap is removed and the trapped gas shoots the frozen plug (with the spent yeast) out of the bottle. Some extra sparkling wine tops off the bottle and a cork is added to seal the bottle. Chill your sparkling wine prior to serving. With the cage removed, hold the cork in one hand (usually under a towel) and the base of the bottle in the other. Turn the bottle, not the cork, slowly and gently. You want the cork to ease off with a soft “whoof” (with the cork in your hand,) not with a “pop” – and the cork sailing across the room.